Allen College is located on a beautiful new park-like campus in Waterloo, Iowa, and stresses the interrelationship of academic and professional studies. Allen students will be prepared for their future as health professionals with confidence and competence. Our web pages give you a glimpse of the range and depth of our undergraduate and graduate programs and services available to our students, faculty, staff, alumni, parents and other community members. Allen College is at the forefront of educating healthcare professionals in Iowa. The College is very proud of the quality of our academic programs and the special emphasis we provide in nursing and health sciences. It is an exciting time at Allen College as we have many accomplishments to celebrate and we are changing the direction of nursing and health science education in Iowa. We are offering our students more and better opportunities to reach their goals and embrace their roles as healthcare professionals of tomorrow. In 2014, Allen College will celebrate its 25th anniversary as a degree-granting institution. In 2014, enrollment set a new record in January of 621 students. In August 2013, we had our first graduates from the Doctor of Nursing Practice program. Allen College now offers four nurse practitioner tracks in the MSN program: family, adult-gerontological acute care, adult-gerontological primary care and family psychiatric mental health. In fall 2013, Allen College implemented a new master’s program in community/public health nursing. We plan to offer a two new bachelor’s degree programs: public health (fall 2014) and dental hygiene (fall 2015). We also are planning to start two new graduate degree programs: Doctor of Education (EdD) in the Health Professions (fall 2014) and the Master of Occupational Therapy (fall 2015). Graduates from all of our nursing programs pass licensure and certification examinations at rates that exceed state and national average pass rates. The Diversity and Inclusion Services was established in 2009 to help Allen College become a more inclusive community. Various activities are now underway to diversify our community. 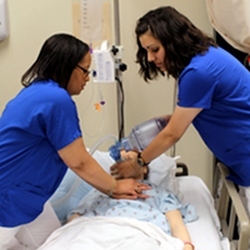 In 2011 Allen College has received a Nursing Workforce Diversity (NWD) grant totaling $984,559 over three years from the U.S. Department of Health and Human Services. This grant focuses on recruiting and retaining underrepresented students in nursing, including ethnically diverse students. The Anne Christensen Doyle Center for Engagement, Learning and Leadership (CELL) coordinates a variety of service learning and volunteer activities for students, faculty and staff. The College is nationally recognized for its commitment to community service. Students enrolled in the BSN program can graduate with honors by completing special courses focused on service learning. These are but a few of our many accomplishments in the past few years. Enjoy your visit to the Allen College website and come back often. There's always something new to learn about this energetic and exciting place.